You need to click on this pic to enlarge it to see just how cool these sandstone rocks appear. And of course on the other side of the road is the Colorado River. This is why I run Moab. I also visited the Arches National Park on this year’s trip – that was incredible. Believe it or not, there are nearly 3000 other runners right behind me in this pic, as well as a couple hundred more directly ahead of me. 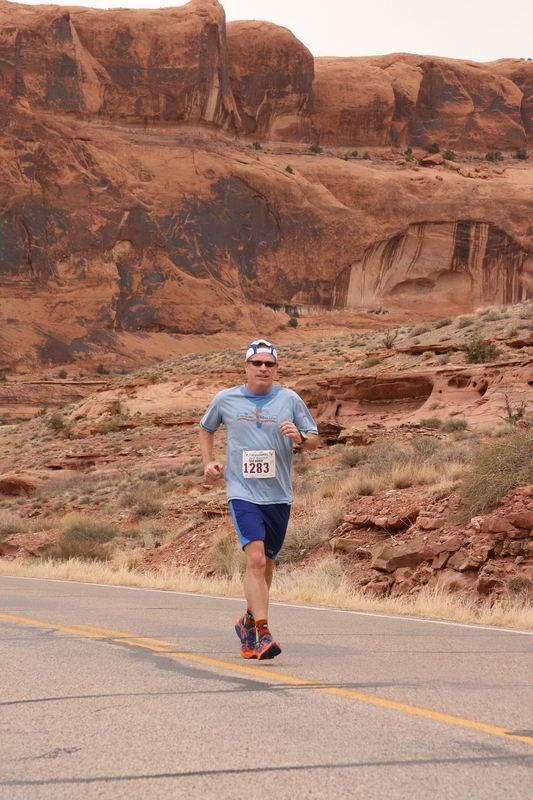 I don’t recall ever being this alone during the Moab Half Marathon. But I was alone in Moab. Karen and Ellie didn’t make the trip. They’ve traveled to Moab before, and to Manitou Springs and Ouray and Telluride, just to watch me run. But mostly I go alone. Just like on most of my workouts. I prefer it really. I’m not totally asocial. I like to get in a team run every now and then with my neighbors. But part of what I like about running is being able to step out the door on my watch. Running my pace. And the solitude required for introspection. My personality is dead in the middle of extrovert and introvert. I benefit from time with people but need time alone to think thoughts that wouldn’t come to me otherwise. So running works for me. My legs were heavy today and I didn’t think I’d go for more than seven or eight miles. But the sun was out strong and the air was still. The snow wasn’t as deep as yesterday, much of it hammered down on the trail from runners, dogs and cross country skis. While my legs hadn’t fully recovered from yesterday’s ten miles, I felt good being outside and kept it slow for a twelve mile run. Not sure when the tracks were made because I didn’t encounter a single runner during my two hour escape. Just me today, alone on the trail.